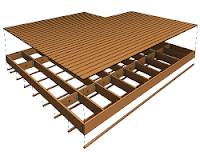 Wood Framing Floor makes wood framing of floors fast and easy with real-time full project updates in Revit®. Plus it generates views with automatic dimensions for floor panels or segments as well as accurate bills of materials and shop drawings. So quality production and accurate assembly on site are ensured. Connectors, cuts, supports, and other details can be distributed based on predefined rules or connection types. They can then be modified or updated to suit the project design stage and the level of detail required. Floor frames and the layout of frame elements and details can be modified and updated whenever the project is changed. Dynamic update functionality can make changes to all floor frames of the same type at once. Floor frame elements in the project can be easily marked based on their properties and locations in the floor structure layer. And information for fabrication can be automatically generated with all desired views, schedules, and drawings for each floor segment or panel. Takes the architect’s designed floor and automates panel layout planning. The software draws symbolic lines to indicate the future panels according to predefined rules. Then it creates real Revit floor panels. Automates wood framing work with floors in Revit® projects. It's powerful, flexible and easy to use. It helps you make better decisions, move much faster and avoid errors at every BIM stage – from design and documentation to segment fabrication and construction. Optional export to any CNC machines and CAD/CAM production lines, such as WEINMANN, Randek, etc. Gives Revit® users a single robust platform to generate wood truss systems instantly, perform structural analysis, and auto-generate shop drawings tailored to your standards. Functions are versatile, parameters are easy to control, and changes occur in real time. 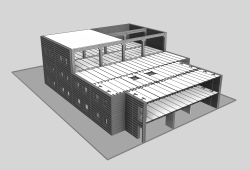 Creates openings with fire safety components throughout a Revit® model where ducts, pipes, cable trays and conduits intersect with walls, floors, roofs, ceilings, beams and columns. Cut Opening creates openings with special holding details for structural beams. Wood Framing Floor is brought to you by AGACAD. Pricing was not known at press time.